It was the fall of 2017, that Adam’s wife made the decision that she would like to live and work in Sweden. Her friendly “tourist visa” in the UK was just about up, and this was what both of them had been waiting for the better part of two years! Obviously, they didn’t want to leave their bikes at home but summer was pretty much over. However, it seemed like the last window of decent weather was still open! Now, both consider biking in England to be rather unpleasant. People in cars tend to drive considerately, but still loathing that they have to share their tiny, narrow roads with these pesky bicyclists. Most of the roads have no consideration whatsoever for bikes (some of the cities may have exceptions, but not many). Adam’s father, one of those car drivers, would not hear of them biking to Harwich to catch the ferry to Holland but instead loaded them up (two adult bikes, a full trailer, a tag-along bike and all their backpacks, panniers and camping gear, Adam, and his wife, their son and their dog) and dropped them of there to catch the late night ferry. 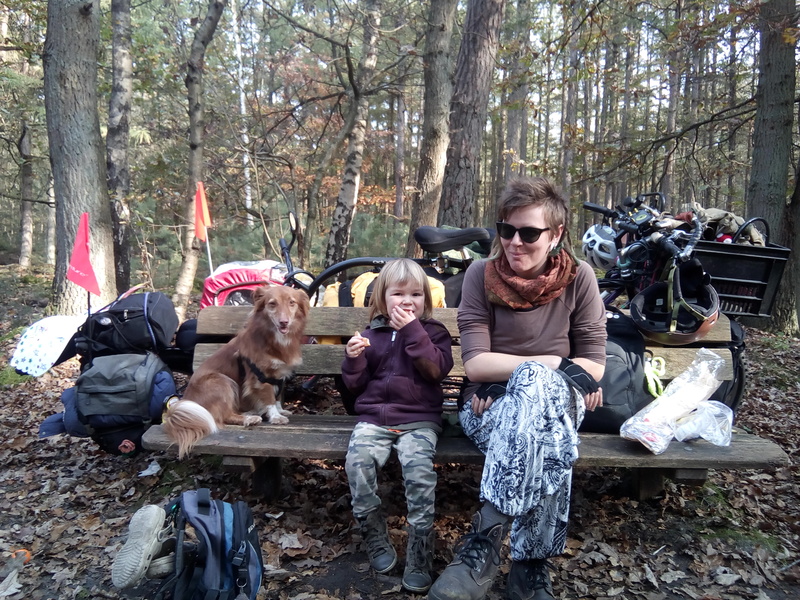 After assembling their bikes together, feeding the kid and dog, looking at maps, waiting in a queue with cars with a very tired kid struggling to remember the words for his favorite songs they finally got to tie their bikes to the humble bike corner (amongst the lorries) and head up to their cabin for some sleep. As soon as they got off the ferry, they all got blown sideways. It looked like they were deviating from the path of exit they had to follow and the staff at the border were wishing them “good lucks” and apologizing for the strong winds. Despite the wind, it was biking heaven. No hills, just follow the signs and stay on the bike paths. Easy peasy. After the first hour they faced a ten-minute shower that caught them off guard and saturated them, but then the sun came out and it was all wonderful. They reached their first destination in the evening were Adam knew some people and had access to a bike workshop. They changed Adam’s wives handlebars to make room for a Dutch-style front rack and also bodged together an old back rack to fit on their sons 20″ tagalong bike to give him space for panniers and even out the weight. 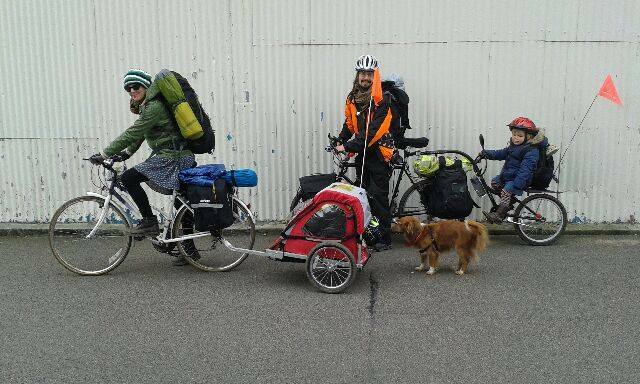 Now, some may think, they are carrying too much stuff, but this wasn’t just a bike trip, this was an emigration of sorts. To find their luck and settle down in the promised northern lands! Their next bike trip would not be like this, they promised. Anyway, with this kind of “just get to the destination” attitude that has gotten them around on all their travels in the past (mostly hitchhiking and walking), they kept on going. They stopped at the ADM (a cultural center) outside Amsterdam where they got to clean toilets for a festival and prepare for the next leg of the journey. Adam found a nice beer crate that he strapped to the front of his bike for the dog to rest in so they could bike further in a day. They ditched the tent and relied on improvising their tarp at off-peak campsites and warmshowers.org. They were almost out of Holland, and the weather forecast did not look promising. Autumn was fully here, and they were heading north with a three-year-old in rain clothes. Most of the biking that followed was nighttime biking around German cities. They were looking for dog-friendly cheap hotels between the trains they took to get north as quick as possible. Which was an experience in. 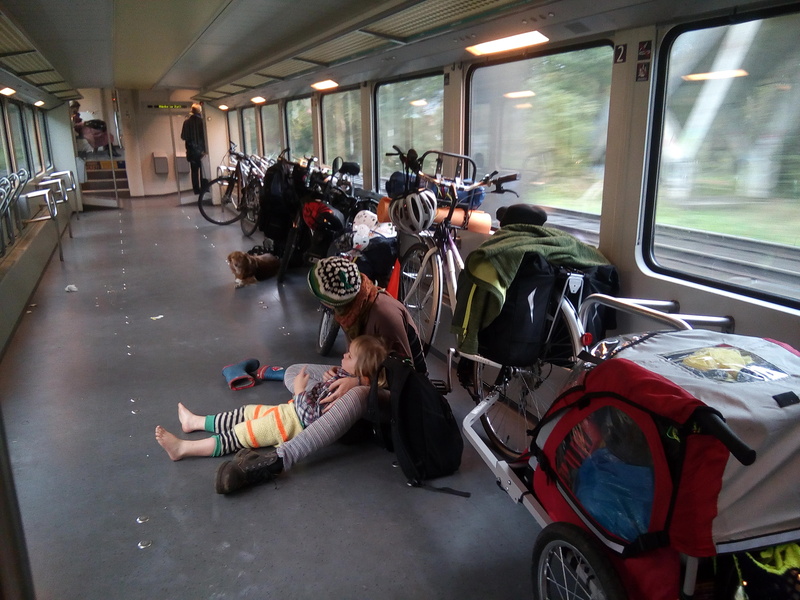 The fact that the German train companies allow you to bring bikes onboard really saved them! In Sweden and England, these options are somewhat limited. The platforms and trains in Germany are also even, so no lugging bikes and trailers upstairs and narrow corridors, which was also a great relief. Though there were quite a few train station elevator trips where they would race to cram one bike, one trailer, one adult and the kid into a tiny and public elevator, arrive onto the platform. Then unloaded and send the elevator back and the other adult would be left with what remained. Sometimes all this happened with only minutes to spare. Those hectic moments were less fun. They finally got to relax in Kiel at a very kind host, which was more like some sort of cooperative in a series of old military houses with plenty of kids. Adam needed to get a new brake-cable for his bike and a new kickstand since his wives “sturdy” Y-kickstand had snapped earlier rushing through one of the train stations. They rested for a few days and got an overnight ferry to Gothenburg in late October 2017. It was getting cold. Arriving in Gothenburg by ferry was bittersweet. They had arrived in the country of destination but at the wrong time of the year. It was wet, cold and hilly! They had only had a handful of hills to tackle so far, but around Gothenburg, the hills are just everywhere, and their “setup” was feeling again. The only train company in Sweden that lets you bring a bike, TÅGAB, was going straight to the neighbor town Degerfors next to Adam’s hometown. They just wanted to get there before the rain and cold got the best of them. They arrived in Degerfors quite late, then ate a pizza each and biked the last surreal 12km in the dark along the road with the occasional car zooming past, blinding them. Only recently did they install a rail guard to separate the bike lane and the road for this road. Adam surely wishes they did more of that sort on the Swedish motorways! They learned a lot from this trip. However, they decided that their next big bike trip will be in the summer for sure, with more focus on camping, enjoying ourselves, and biking!